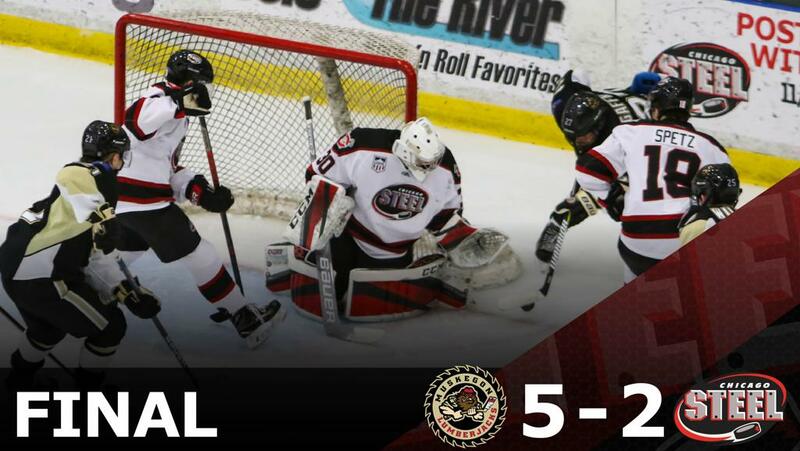 GENEVA, ILLINOIS — The Muskegon Lumberjacks exploded for four goals in the third period, defeating the Chicago Steel 5-2 Saturday night at Fox Valley Ice Arena. Back-to-back goals to open the third for the first-place Lumberjacks (10-1-0-0, 20 pts.) were too much for the Steel (4-6-1-0, 9 pts.) to overcome. "We took it to Muskegon for the majority of the game," said Steel Head Coach Greg Moore. "As the weekend went on we got stronger through all six periods and deserved a better result tonight." After a back-and-forth first period, Muskegon was the first to find the net 15:30 into the opening frame. After a shot from Muskegon defenseman Nash Nienhuis fell to the side of Chicago goaltender Justin Robbins, forward Brock Bremer chipped the loose puck off Robbins’ back and into the net. The Steel threatened for the tie late in the period with their second powerplay chance of the game but a shot from Chicago defenseman John Spetz rang off the post. Chicago found the equalizer 6:55 into the second when left wing Robert Mastrosimone scored his team-leading eighth goal of the season. The Boston commit sent home his own pass after he banked the puck off the side boards before finding the upper corner past the glove of Muskegon goaltender Brandon Bussi. The goal pushed Mastrosimone’s point streak to five games (4-2-6) and marked his third-straight game with a goal (4-0-4). Each team had a chance at their second of the game but Robbins and Bussi each came up with a pivotal breakaway save in the back half of the second period to keep the game tied at one. Muskegon scored twice to open the third period as Bremer scored his second 4:18 in followed by forward Nolan Sullivan 4:27 later to make it 3-1. Chicago defenseman Matteo Pietroniro cut into the lead at the 10:31 mark when he toe-dragged a Muskegon defender before beating Bussi high on the blocker. The Lumberjacks slammed the door as forward Jack Williams scored with less than four minutes to play and later finished it off with an empty-net goal. The Steel return to action on Friday, Nov. 9 for a 7:05 p.m. puck drop against the Waterloo Black Hawks. Next Friday is 70s Night at Fox Valley Ice Arena and also the first of six Raising Cane’s Kids Days. Kids 12 and younger can receive a Red Zone ticket, Steel drawstring backpack and Raising Cane’s free kid’s combo card for just $10.